8 vintage live tunes from 70 year old septuagenarian Van Morrison - Gloria, Brown Eyed Girl, Moondance, Into the Mystic, Domino, Bright Side of the Road, Someone Like You, Keep it Simple. Born August 31, 1945, baby boomer Van (George Ivan) Morrison was born in Belfast, Northern Ireland. His father, electrician George Morrison had a huge and diverse record collection from his days in Detroit, Michigan; Van listened to music by Ray Charles, Solomon Burke, Muddy Waters, Charlie Parker, Woody Guthrie and Hank Williams while he was growing up. When Van was 11 his father bought him an acoustic guitar and the next year he formed The Sputniks, his first band. By the time he was 15 he'd also gotten a saxophone courtesy of his father, and took lessons in reading music and playing the sax. 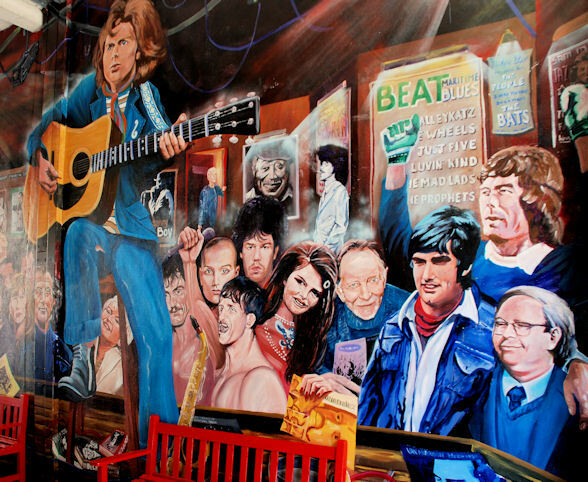 Below, Van Morrison is depicted in the top left corner of the Belfast "Duke of York" mural of Northern Ireland personalities. Also depicted in the mural are Irish soccer players George Best and Pat Jennings (top right corner). 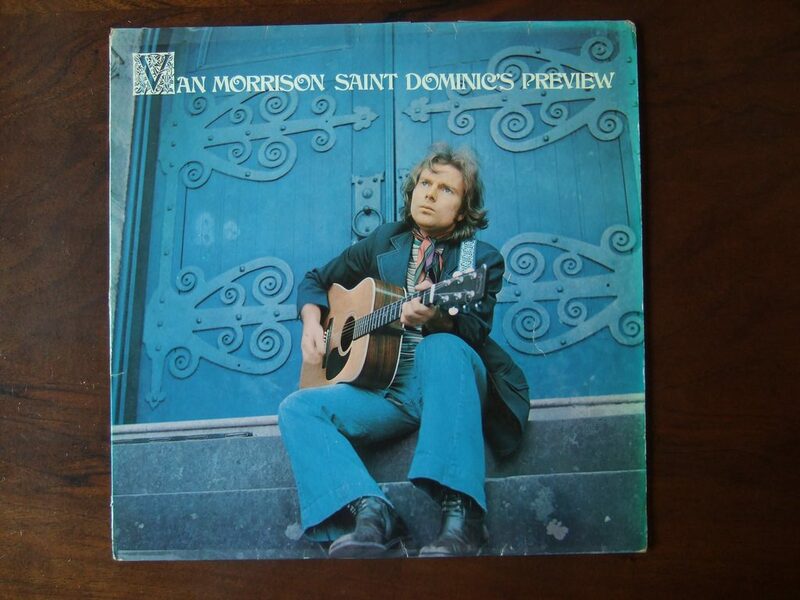 Morrison sang and played guitar and sax with different bands including Deanie Sands and the Javelins (later changed to the Monarchs). He continued playing with the Monarchs after graduating high school at age 15 and taking a full time job as a window cleaner, going on a European tour with them (now called the International Monarchs) when he turned 17. The International Monarchs recorded their first single in 1963 in Cologne, Germany, but broke up upon returning to Belfast in late 1963. Short stints in more bands followed - the Manhattan Showband, Brian Rossi and the Golden Eagles (the Wheels) - before Van Morrison formed his own new R&B band called Them in 1964. Them played cover tunes as well as performing some of Morrison's original songs. They were signed by Decca Records to a two-year contract and recorded two albums with 4 hit singles - Baby, Please Don't Go (1964), Here Comes the Night (1965), Mystic Eyes (1965) and Gloria (1965). Mystic Eyes and Gloria were written by Van Morrison, and baby boomers will remember Gloria (below, being performed live in 1965), which has since been covered by many other rock artists. Them toured the US for two months in 1966, and while on tour in California 21-year-old Van Morrison met red-haired, brown-eyed American divorcee and mother of one (son Peter), Janet "Planet" Rigsbee. After returning to Belfast at the end of the tour, Them broke up. Van Morrison turned to songwriting; he wrote the song Brown Eyed Girl about Janet Rigsbee, and kept in touch with her. He was soon signed to a new contract by Bert Berns, for a company Bert had started called Bang Records. Morrison was flown to New York to record 8 songs for 4 singles to be released by the new label; he was later surprised to discover the songs were instead released as the album Blowin' Your Mind! One of the songs on the album was Brown Eyed Girl, and when released in 1967 as a single, went to #10 on the US Billboard Charts; Brown Eyed Girl is still the most requested Van Morrison song. Below, Van Morrison performing Brown Eyed Girl live in 1967. Now living in New York, Van Morrison dealt with a contract dispute when Bert Berns, the owner of Bang Records, died and his widow prohibited him from performing or recording in the area. Financial problems soon followed since he couldn't record or perform, and on top of that he had serious visa problems; deportation was imminent, until he married his American girlfriend, Janet (Planet) Rigsbee. Janet and Van Morrison moved to Cambridge, Massachusetts and Morrison was once again able to perform. Warner Bros. Records bought out his contract with Bang Records and the critically acclaimed but commercial unsuccessful album Astral Weeks (with heavy mystical and Celtic overtones) was released in 1968. His next album, Moondance (1970), was also produced by Van Morrison and became an R&B hit, selling over a million copies. Moondance the single was not released until 1977. Below, Van Morrison performing Moondance in 1979 live. Below, Van Morrison performing Into the Mystic. The hit single Domino was on Van Morrison's fourth album His Band and the Street Choir (1970), which made it to #9 on the Billboard Hot 100. Below, Van Morrison performing Domino on Bert Sugarman's Midnight Special in 1977. Janet and Van Morrison's daughter Shana (singer-songwriter Shana Morrison) was born in 1970, and over the next few years the couple moved from Massachusetts to New York and California. The Tupelo Honey album (1971), featured Janet on the cover and came out before the couple divorced in 1973. When singing in front of large audiences in 1972, Van Morrison began to suffer from stage fright and had to take a break from performing. On Morrison's return to live concerts he restricted his appearances to smaller audiences, often performing with sunglasses or with his eyes closed. After releasing an album in 1975, Van Morrison took a three year break from music and moved Europe. He began recording and releasing more albums starting in 1977; his album Into the Music (1979), included the song Bright Side of the Road, was later featured on the 1996 John Travolta movie Michael. Below, Van Morrison performing Bright Side of the Road in 1979. For a while in the early 1980's, Van Morrison lived in Denmark and was influenced by the relationship with his then-love, Ulla Munch who lived in the Vanlose district of Copenhagen, Denmark. The album Beautiful Vision (1982) included singles Vanlose Stairway and She Gives Me Religion....reflecting their shared spiritual interests and his source of inspiration. The instrumental tune Scandinavia featuring Morrison playing piano was nominated for a Grammy Award for Best Rock Instrumental Performance. Van Morrison's music began to shift away from rock/R&B in the late 1980's as he got older, to the more mature sounds of ballads and folk tunes. His album Poetic Champions Compose (1987) included the romantic song Someone Like You, has been featured on several movie soundtracks - French Kiss (1995), Someone Like You (2001). Below, Someone Like You is heard in the movie Bridget Jones's Diary (2001). Van Morrison's 1988 album Irish Heartbeat was recorded with the Chieftains and covered traditional Irish folk songs, the beginning of a trend of Morrison collaborations with different artists. Album releases continued through the 1990's, along with live jazz performances, and an album of skiffle music. In 1992 Van Morrison met Michelle Rocca, a married mother of three young children, and a former Miss Ireland 1980. The couple dated/lived together for most of the 1990's, eventually marrying when Morrison was 50+ years old. They had two children together - daughter Aibhe Rebecca Morrison (2006) and son Fionn Ivan Morrison (2007). Michelle appeared on two album covers, No Prima Donna: The Songs of Van Morrison (1994), and Days Like This (1995). 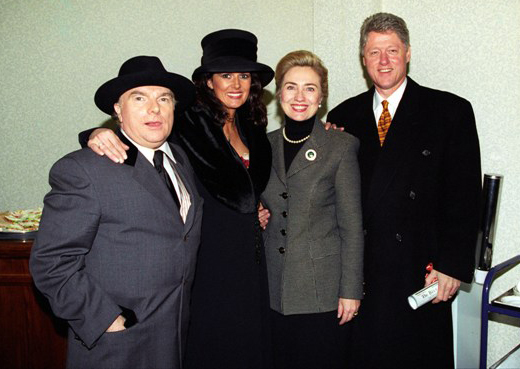 Below, Van Morrison with President Bill Clinton and First Lady Hilary Rodham Clinton in 1995. Having recorded five albums there already, in 1994 Van Morrison bought Wool Hall Studios near his home in Bath, England; the studio has since closed. Morrison has also had a property in Dalkey, Ireland, for many years. In the 2000's and his 55+ years, Van Morrison has continued to tour and formed a production record label for new albums at the pace of one every year or so since 1999. The 2002 album Down the Road had R&B, folk, country and blues songs and was both a critical and commercial success; Magic Time in 2005 was equally as successful. More country music turn up on his 2006 album Pay the Devil, and it hit #10 on the US Country Music charts. 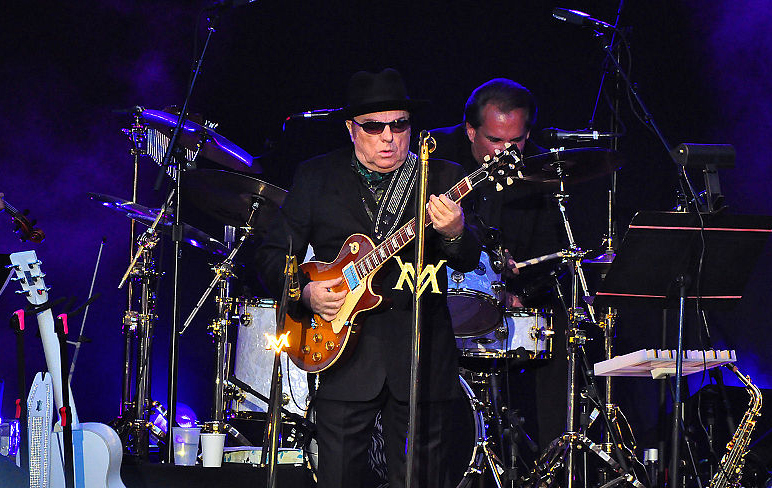 Keep it Simple (2008) was a #10 Billboard hit; below, Van Morrison performing Keep it Simple in 2008. Van Morrison was inducted into the Rock and Roll Hall of Fame in 1993, and has also been inducted into the Irish Music Hall of Fame and the Songwriter's Hall of Fame. His daughter Shana Morrison (by first wife Janet) began touring with him as a backup singer in his band starting in 1993. They've performed and recorded occasionally since then; right, with his daughter Shana in 2012. The book Lit Up Inside (2014) is a selection of Van Morrison's song lyrics from his 50+ year career in songwriting and music. Van Morrison shows no signs of wishing to retire. He's released two albums so far as a senior citizen, including 2015's Duets: Re-working the Catalogue, his 35th studio album. Morrison was knighted in June 2015, and can be seen in concert this July/August (2015) - Pretty good for a 70-year-old septuagenarian senior citizen. Happy 70th Birthday, Van Morrison! How amazing to be on the planet while Van Morrison is lighting up the airwaves. What a piece of luck. You know? Figure the odds. So grateful for all this joyousness wired right into my soul. So damn grateful. Hugs!